Students, dance enthusiasts and first timers were treated to some world-class lessons in Birmingham over the course of the week. Tango aficionado’s Julia Urruty and Claudio Gonzalez’s class was on fire. Total novices and more experienced dancers were taught the art of the tango by world-class professionals, and by the end of the class a mini milonga in itself erupted. 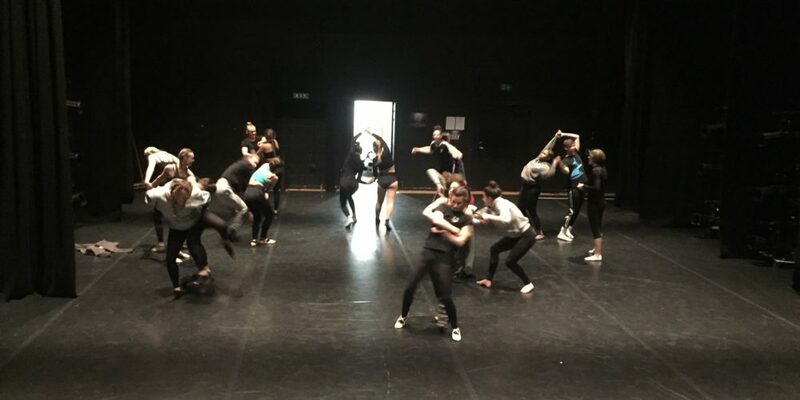 The next day more experienced contemporary dancers including BTEC level 4 students from nearby schools were given a serious schooling in contemporary dance by Havana based Julio Torres and Yanelis Manzanet from Acosta Danza. This comprehensive class began with floor exercises and ended with a full rep. Finally, just before the Friday night performance, Barcelona local Facundo from Iron Skulls Co raised the roof with his break dancing lesson. Packed full with local hip-hop dancers of different ages and genders, Facundo had a buzzing room full of poppers and lockers by the end. Pictured above the Acosta Danza class in full swing. Birmingham New Street train station was transformed into a dance floor where the only arrivals were contemporary dance and tango. 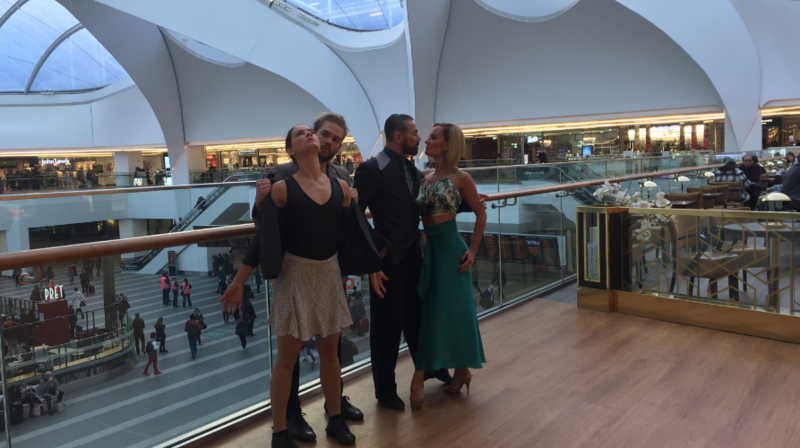 Showcasing two of the ranging talents that would later be on the Hippodrome stage Julia Urruty and Claudio Gonzalez an award winning tango duet alongside Acosta Danza dancers Julio Torres and Yanelis Godoy cho-cho-chose to smash it at the station. Pictured above the four dancers and below a video of the Acosta Danza performance. Sidi Larbi Cherkaoui, the monks of the Shaolin Temple, Ali Thabet, and a team of musicians and technicians embarked on a tour of Japan with performances at Orchard Hall, Bunkamura Tokyo, Aichi Prefectural Arts Centre, Nagoya and Kitakyushu Performing Arts Center. All the performances were received incredibly well, with Japanese fans showing their glee on social media. The final performance at Kitakyushu marked the one hundred and ninety fourth performance of Sutra. So if you missed out, make sure you are there for the two hundredth performance. And if you want to know where that’ll be visit this page or the Sadler’s Wells touring page to keep up to date. 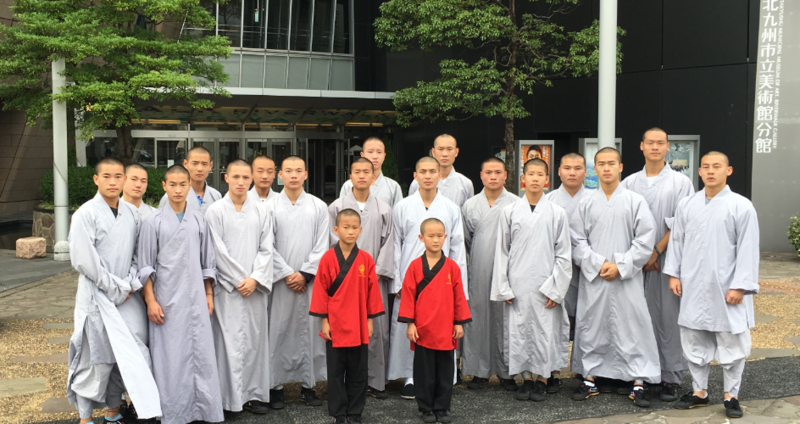 Photo above: Sutra’s monks of Shaolin Temple outside Kitakyushu Performing Arts Center, taken by Company Stage Manger, Marius Arnold-Clarke. Milonga travelled to Auckland for Auckland Arts Festival where the show was performed to a full house and received a standing ovation. Prior to the performance the cast and crew were treated to a fantastic welcome in true Kiwi style, which you can watch below. Also Nelida, tango advisor, was interviewed by the New Zealand Herald which you can read here. 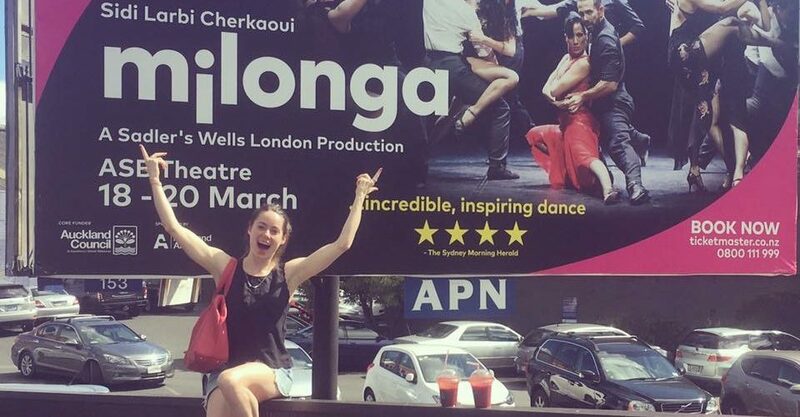 Pictured above is Jenny White, contemporary dancers posing in front of milonga’s huge poster. Just as the calendars went from 2015 – 2016, m¡longa proved it’s timeless quality as everyone set off to Chile for four performances as part of the Santiago a Mil Festival. The performances went fantastically, and as always it was a smash-hit success with the audience enthralled by the dazzling alternative take on tango. Pictured above is all of m¡longa’s cast and crew on stage at the Teatro Municipal De Santiago in all their glory. The m¡longa team left their warm homes in Buenos Aires and flew to Moscow last week – where it was a significant few degrees colder. However, once they arrived in Russia and began their feisty tango moves the city began to melt as it become hot and fiery and filled with South American passion. Over the course of two performances to a jam packed audiences m¡longa’s universal appeal was evident and that wherever it is being performed in the world, audiences will always give it a standing ovation. 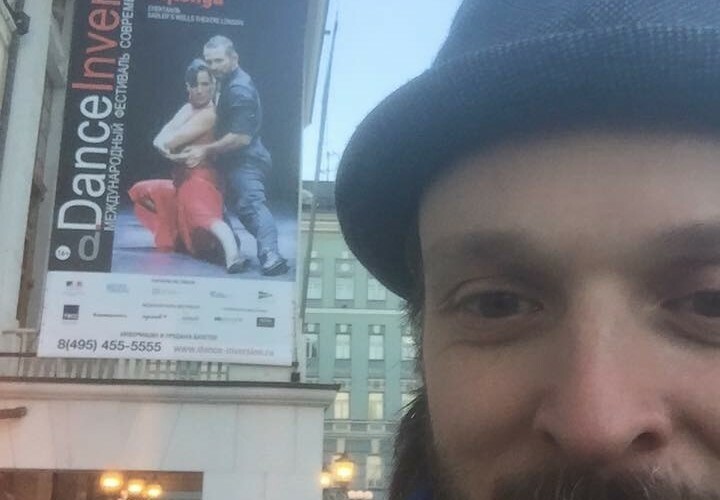 Pictured above is proud choreographer Sidi Larbi Cherkaoui catching a selfie with the m¡longa hanging poster outside the Bolshoi Theatre. Click here to see m¡longa’s touring information. Sidi Larbi’s m¡longa was in Stuttgart last week where it was performed at Theaterhaus Stuttgart as part of Tanzfestival Colour. The show went down incredibly well and the audience quite literally wouldn’t stop clapping. If you’ve seen the show you may well recognise some of the faces pictured above from the stage. 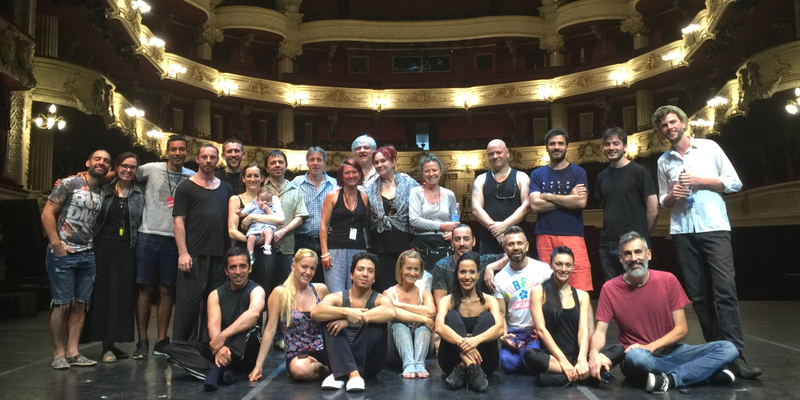 But also in this photo the dancers are joined by some of m¡longa’s hard-working technicians and one of our producers and a familiar face on the blog, Sandra. This week m¡longa is on the stage of The Norwegian Opera House for six performances. The shows have been met by a fantastic response – culminating in all of the audience up on their feet for a standing ovation. 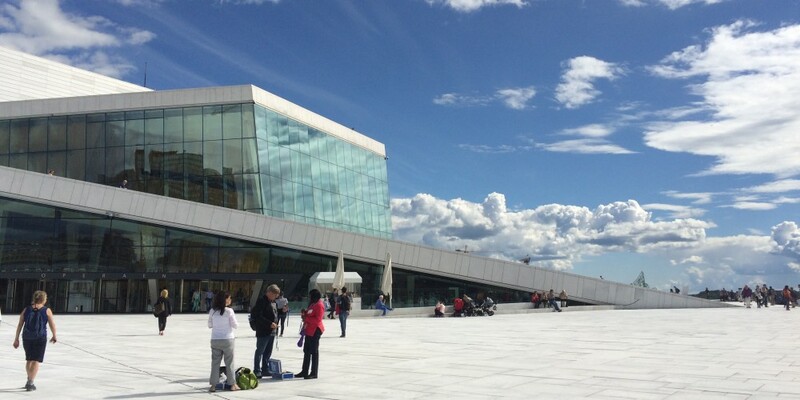 And what a beautiful theatre for a beautiful show: The cast and crew were able to wade through the Fjord and all the way up the slopping roof before delivering the best alternative take on tango that exists. Next up for m¡longa: Stuttgart. This week m¡longa had its one hundredth performance. This took place at no better location than the Sadler’s Wells stage itself. Since its premiere m¡longa has visited fifteen different countries at thirty-two different venues, across four different continents. Including New York City Centre, Sydney Opera House, and Theatre du Jorat, in the Swiss Alps where it premiered. 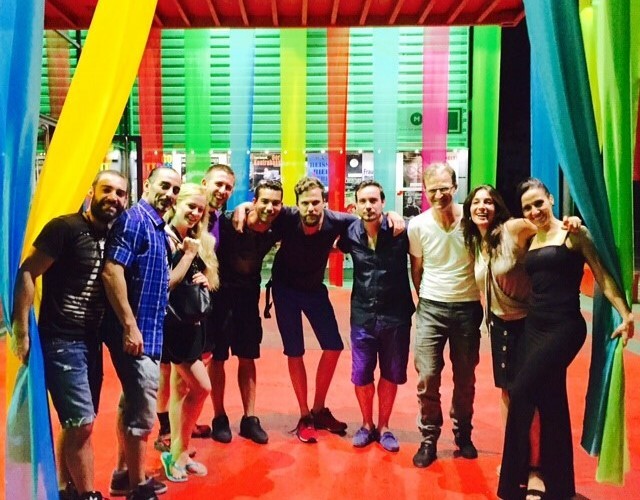 But don’t worry m¡longa is still going strong and it’s tour continues – next stop Stuttgart/Oslo. Keep checking the blog to find out what goes down there. ¡Good Morning Argentina (and other Spanish speaking nations)! 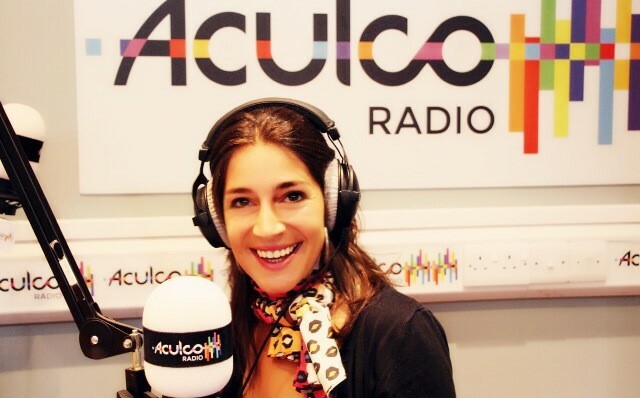 Our very own Sandra Castell-Garcia was behind the mike live on the airwaves on Friday talking all things m¡longa in the run up to the performances at Sadler’s Wells this week. Speaking in her native Spanish, she discussed the show with the presenter. Want to listen to the show? Click here. And if you can’t speak Spanish fear not – all you need to know is that as a show, m¡longa is muy muy bien!